Steering gear is a recirculating ball-type, available in either a constant or a variable ratio design. 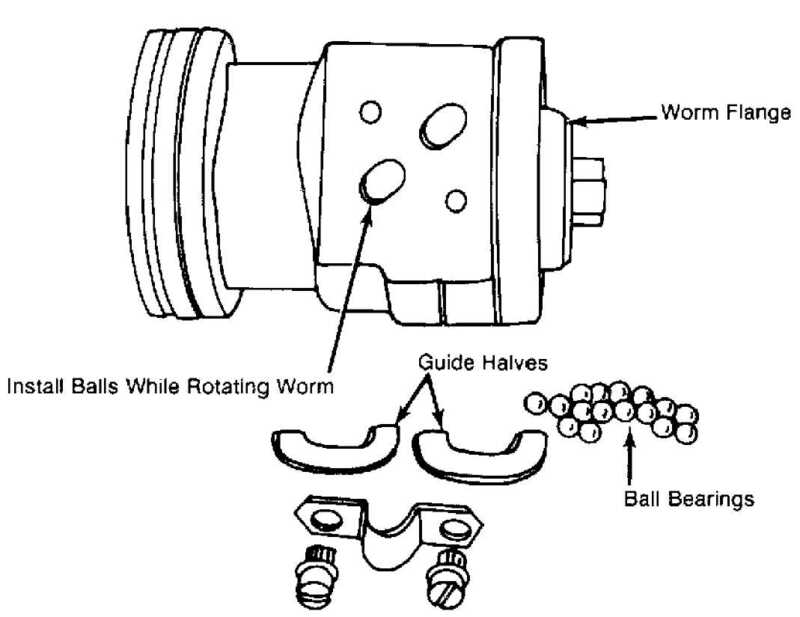 Steel balls form a "rolling thread" between steering gear worm shaft and rack/piston nut. Worm shaft thrust is absorbed by a thrust bearing and two races at lower end, and by a bearing in adjuster plug at upper end. This design puts spring pressure on worm shaft to ensure proper thrust bearing preload. 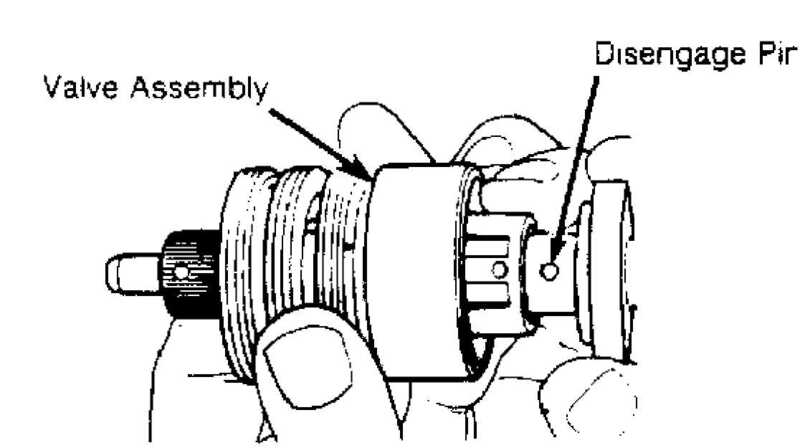 Adjuster plug provides initial preload adjustment and service adjustment (when repairing gear). As worm shaft is turned right, rack/piston is moved upward in gear. As worm shaft is turned left, rack/piston is moved downward in gear. The rack/piston teeth mesh with sector, which is forged as part of sector shaft. 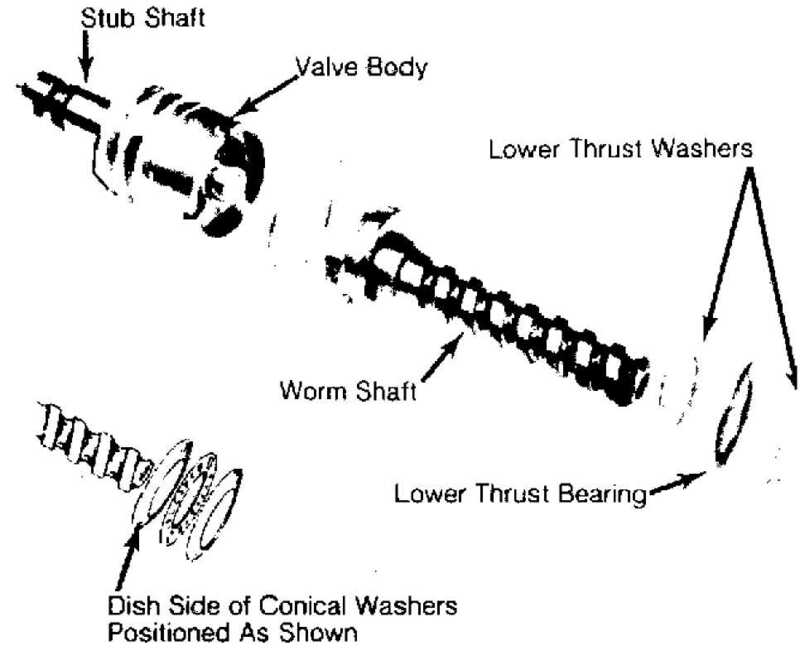 Rotating worm shaft moves sector shaft, which turns wheels through mechanical linkage. See Fig. 1. 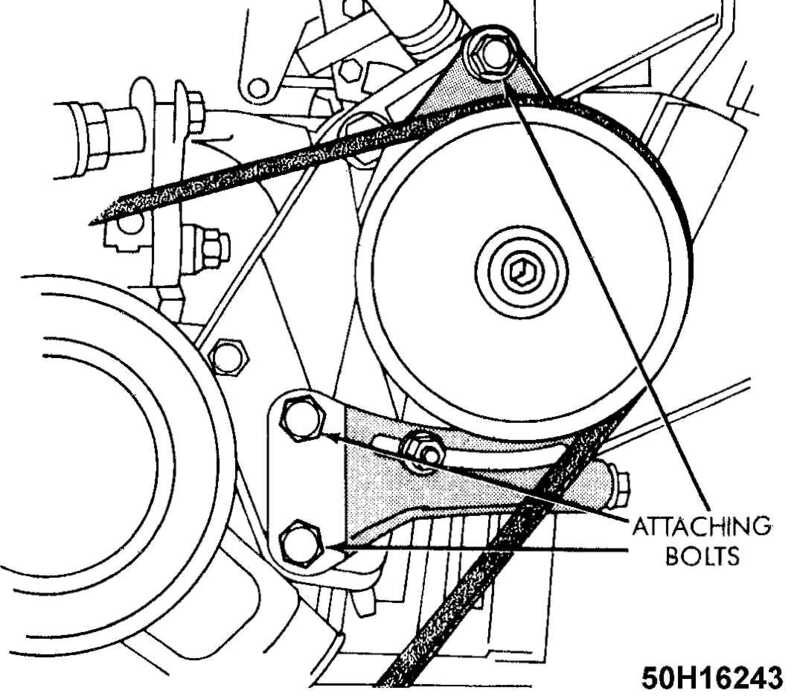 See POWER STEERING GENERAL SERVICING article. plug is seated in housing. This will require 20-30 ft. lbs. (27-41 N.
adjuster lines up with second mark. 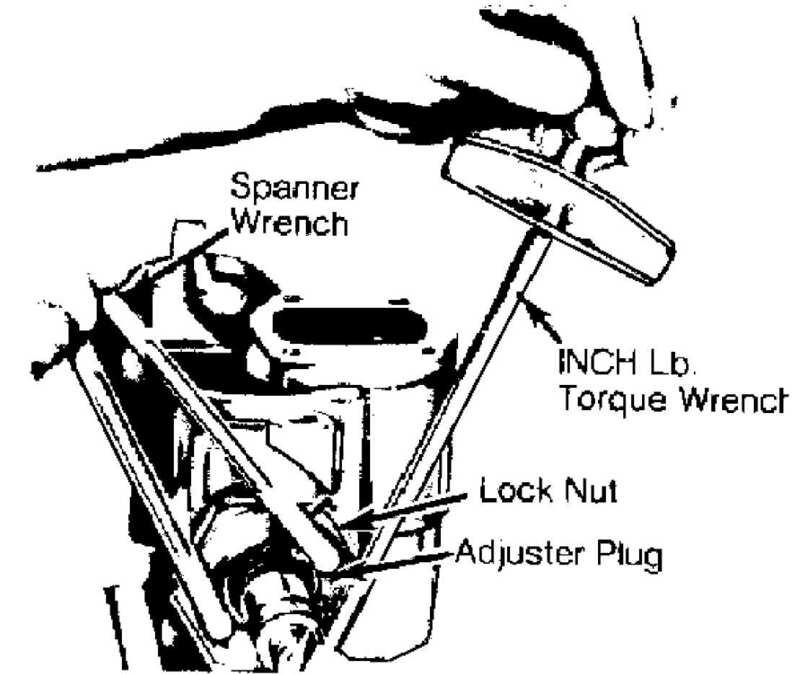 Tighten lock nut. Ensure adjuster remains in position. shaft to right stop, then back 1/4 turn. reading should be 4-10 INCH lbs. (.4-1.1 N.m). See. Fig. 2.
may have turned while lock nut was being tightened. Steering gear may be incorrectly assembled or worm shaft thrust bearings and races may be defective. Repair as required and readjust preload. shaft from side to side through specified arc on each side of center. See OVER-CENTER PRELOAD chart. Note torque reading going over center. Adjust thrust bearing preload before over-center preload. See Fig. 3. - Total preload is sum of thrust bearing and over-center preload. - In service for more than 400 miles (640 km.). steering linkage from pitman arm. Remove pitman arm from gear. steering gear and mounting bracket as an assembly. To install, reverse removal procedure. Fill pump reservoir. Bleed air from system. 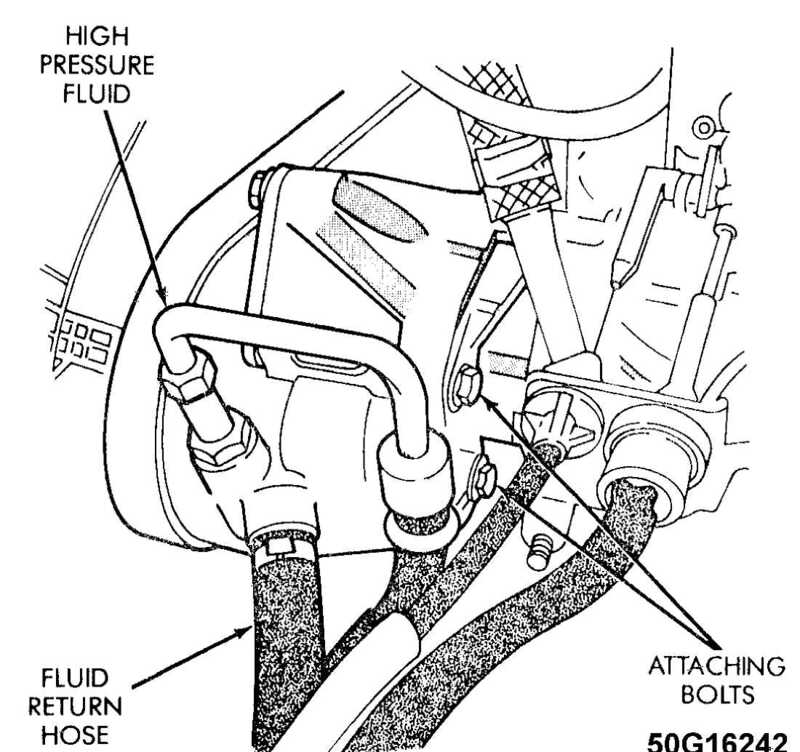 See POWER STEERING GENERAL SERVICING article. 1) Drain pump reservoir. Clean exterior of unit. Measure distance shaft protrudes from pulley, and record for assembly reference. Using pulley remover, remove pulley from shaft. Clamp pump in vise; DO NOT overtighten vise. Remove pressure line union, reservoir mounting stud and reservoir. See Fig. 6. Remove and discard pressure line union "O" rings. ring, rotor and thrust plate assembly from body. Remove drive shaft. 1) Clean all pump components in solvent, and blow dry. Inspect flow control valve assembly for wear, scoring, burrs and other damage. Inspect seal bore for burrs, nicks and score marks. Inspect machined surfaces of body for scratches and burrs. plate and end plate with petroleum jelly. Install new drive shaft seal in housing. Install "O" ring in third groove of housing. Install dowel pins in thrust plate. Install drive shaft through thrust plate and rotor. Install NEW retaining ring. Ensure rotor slides freely on drive shaft splines. and press downward approximately 1/16". Install end plate "O" ring in second groove of housing. specification. See appropriate table under TORQUE SPECIFICATIONS. using pump pulley installer to adjust shaft protrusion. fitting, "O" ring, flow control valve and spring. See Fig. 7.
screwdriver, remove drive shaft seal from housing. retaining ring. Using a brass drift, tap on thrust plate, and remove. with petroleum jelly. Install sleeve. Ensure sleeve is fully seated. pressure plate with dowel pin hole aligned with dowel pin holes. adjacent to one dowel pin. Install rotor with counterbore toward drive shaft end of housing. with bolt holes of housing. Install retaining ring. CAUTION: Pump ring must be installed with identification marks located adjacent to dowel pins. Thrust plate must be installed so indentations in thrust plate align with bolt holes of housing and thrust plate engages with pump ring dowel pins. beveled area of snap ring is properly positioned. return tube with new "O" ring. Install pulley. Cap all openings in gear. Clean gear exterior thoroughly. Force end of ring from groove in housing and remove. inward. Remove piston end plug. CAUTION: DO NOT rotate shaft more than is necessary to remove plug as ball bearings will fall out of worm and rack piston assembly. until sector shaft teeth are centered in housing. lock nut. Remove adjuster plug with a spanner wrench. 1) Lubricate all parts with clean power steering fluid before reassembly. Install the lower thrust bearing and races onto the worm. Cupped side of thrust washers must face toward stub shaft. See Fig. 8.
are parallel to each other and that cupped sides face toward stub shaft. 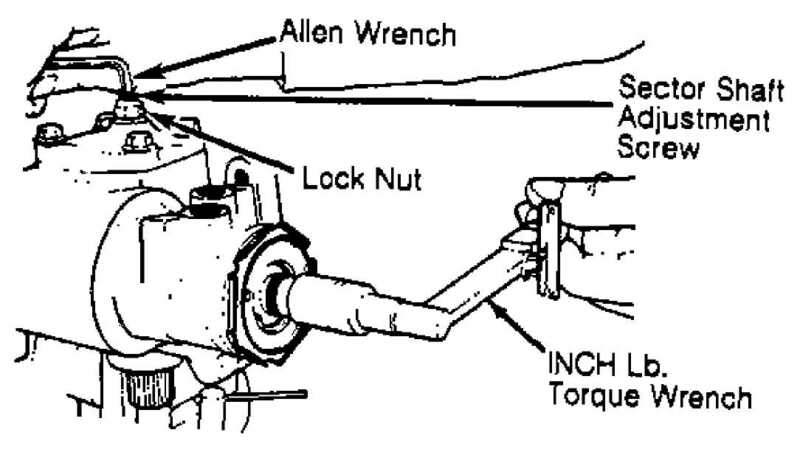 lugs must engage in stub shaft cap. prevent stub shaft "O" ring from disengaging from valve body. 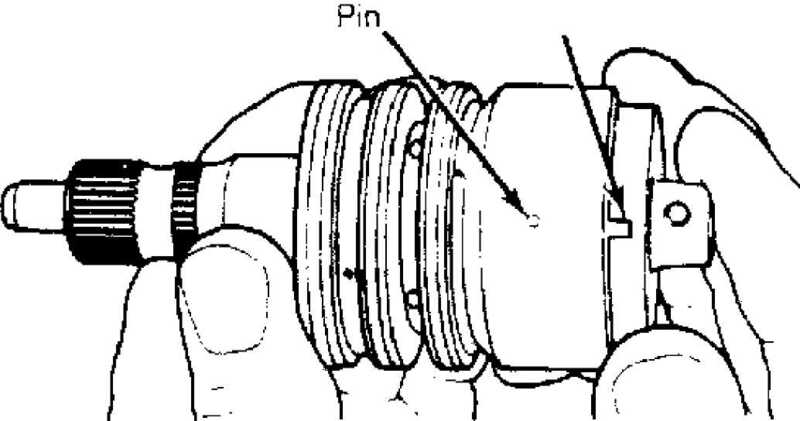 adjuster plug "O" ring, then install adjuster plug. adjuster plug lock nut. Insert arbor and rack/piston into housing. worm. Maintain pressure on arbor until worm is fully engaged. rack/piston is aligned with center of sector shaft roller bearing. Remove arbor. Install a new sector shaft cover gasket. Install adjuster lock nut halfway onto sector shaft. Install piston and plug in rack/piston. Install housing end plug "O"
over-center preload at this time. taking care not to score needle bearing bore. Discard retainer ring. 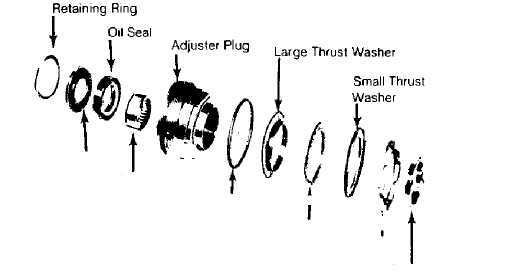 Remove thrust bearing spacer, thrust bearing and bearing races. shaft seal from adjuster plug. remove bearing by pressing out from spacer end. See Fig. 9. Inspect thrust bearing for cracks and rollers for pitting, scoring, or cracking. Check thrust races and spacer for damage or damage. Replace parts as necessary. 1) Press roller bearing into adjuster plug (identification end facing arbor) until bearing bottoms on input shaft seal bore. Install input shaft seal with spring in seal facing adjuster plug. bearing retainer into needle bearing bore. Remove worm, lower thrust bearing and bearing races from rack piston. Remove piston ring and back-up "O" ring from rack/piston. Remove ball return guide clamp, ball return guide and all ball bearings from rack/piston. number of balls to be installed. BE SURE to install light and dark colored balls alternately, as Black balls are .0005" smaller than Silver balls. bearings to drop out of circuits. NOTE: Complete valve assembly is balanced during assembly. If replacement of any part other than rings or seals is necessary, replace complete assembly. 1) Remove and discard stub shaft cap "O" ring. Invert valve and lightly tap end of stub shaft against wood block until shaft cap is free of valve body. Pull stub shaft outward until drive pin hole is visible. Depress the pin to remove the stub shaft from the valve body. See Fig. 11. NOTE: DO NOT pull shaft any further than 1/4" (6 mm) or spool valve may become cocked in valve body. occurs, realign valve and try removal again. CAUTION: DO NOT force stub shaft or spool out of valve body. Remove and discard all "O" rings and Teflon rings. install replacement seal rings over back-up rings. Take care not to damage seal rings during installation. installation. However, heat of operation will straighten them. locating pin and press sub shaft and spool valve into valve body. Install stub shaft cap "O" ring into valve body. See Fig. 13. 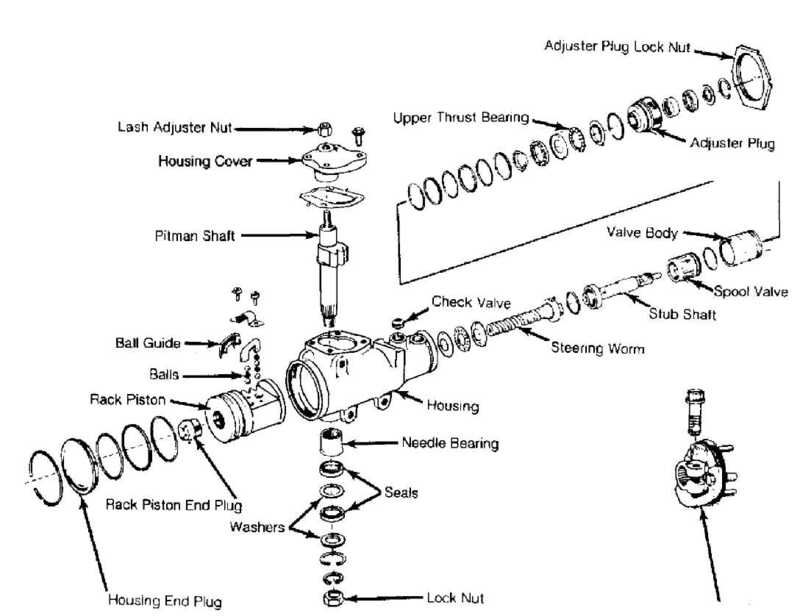 CAUTION: Before installing assembled valve body into gear housing, be sure valve body stub shaft locating pin is fully engaged in stub shaft cap notch. DO NOT allow stub shaft to disengage from valve body pin. Stub shaft locating pin must align with spool valve locating hole. housing. Press sector shaft bearing out of housing from lower end. 18 thread tap. Thread connector seats ONLY 2-3 threads. Install a bolt with a flat washer and nut into seat. 3) Hold bolt from turning and tighten nut to extract seat from housing. 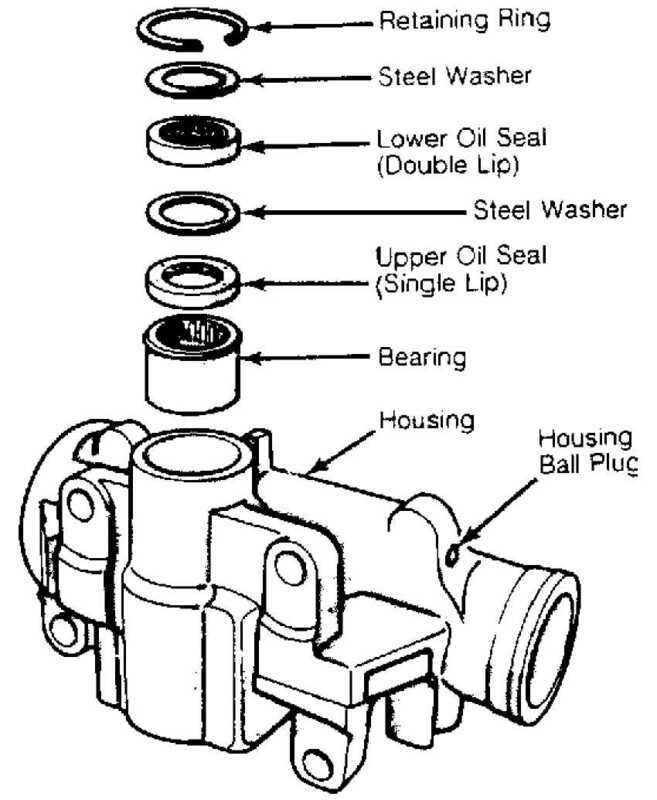 Some steering gear units have metric thread fittings and hose fittings which use "O" ring seals instead of connector seats. Remove check valve and spring from inlet port and discard. housing ball plug for fluid leakage. Seat ball plug with blunt punch. sealant to cure for 2 hours before assembling gear. housing. Replace housing if any surface is worn or damaged. until it is seated .030" (.76 mm) below shoulder in housing bore. Lubricate new seal with power steering fluid. enough to provide clearance for next seal, washer and retaining ring. DO NOT bottom seal against housing counterbore. proper seal action, be sure there is clearance between them.